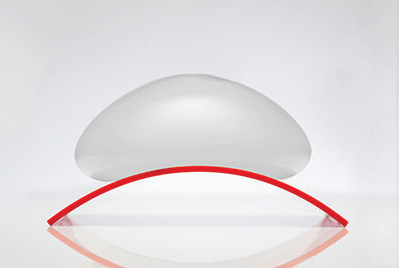 The IDEAL implant is the latest innovation in the field of breast augmentation. This novel implant is uniquely designed to meet the goals of aesthetics as well as safety. It is saline filled for safety and comes with an innovative internal structure that provides a natural feel, but without any silicone gel. The design allows flexible choices with regard to implant placement such as under the gland or muscle as well as volume adjustment and location of the incision. Its internal structure comprises a series of silicone implant shells of increasing size nested together with saline solution filling the spaces in between. It is designed with curved edges, which conforms to the chest wall and simulates the way natural breast tissue is shaped. The chances of wrinkling and folding are minimized as the internal structure controls the movement of the saline solution. When held upright, the internal structure supports the upper portion of the implant, avoiding the collapse – there is no bouncing, scalloping and wrinkling. The amount of saline needed to fill the implant can be adjusted to correct for differences in the size of a woman’s breasts. The implant is placed in the submuscular or subglandular pocket after which inner and outer lumens are filled with saline. It is inserted through a relatively small incision and then filled with saline through two self-sealing valves. For women who want to achieve natural-looking results with saline-filled implants and enjoy the confidence that her implants are intact, the IDEAL implant is the right choice.